Several Truman alumni will be recognized at the Alumni and Friends/Hall of Fame Banquet at 6 p.m. Oct. 10 as part of the Homecoming 2014 celebration. This week looks at the Alumni of the Year. Mike and Janet (Yearns) McClaskey met in 1983 in a McClain Hall classroom and married in 1987. Mike grew up in Kirksville and received his B.A. and B.S.E. degrees in English from Truman, as well as a master’s degree in English from the University of Missouri-Columbia. 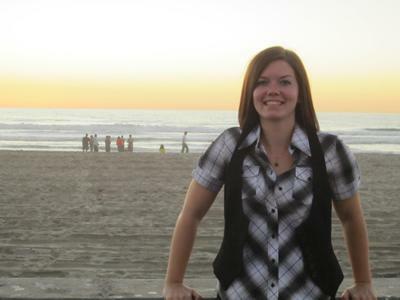 Janet grew up in a northeastern Missouri community known as Brushy (in Schuyler County). 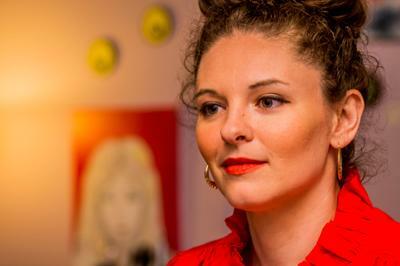 She began her higher education in the Upward Bound Program at Truman. She earned a B.S.E in English education from Truman in 1984 and a master’s degree in education in curriculum and instruction, with an emphasis in English, from the University of Missouri-Columbia in 1996. As executive vice president and chief human resources officer for DISH, Mike is responsible for the recruiting, benefits administration, compensation, and leadership and organizational development for approximately 22,000 DISH team members. Previously, he served as DISH’s senior vice president and chief information officer, providing IT that supported high-quality customer service, new and emerging technologies and innovative products for the next generation of video and broadband services. Before joining DISH in 2007, Mike spent 12 years at Perot Systems where he served as the corporation’s vice president of infrastructure solutions and chief information officer, responsible for IT strategy and operating customer-facing network, service center and data center outsourcing operations. Mike was recently recognized by the Denver Business Journal and the Society for Information Management as CIO of the Year, and was additionally included in Evanta’s Top 25 Breakaway Leaders. Previously, he was the recipient of the 2012 and 2013 Information Week 500, Forbes Top 25 Social Media CIOs, Enterprise CIO Forum’s Transformational CIO and Computerworld Premier 100. Mike serves as a member of the Truman Foundation Board of Directors and is a member of the steering committee for Truman’s current $40 million “Pursue the Future” fundraising campaign. He also served on the steering committee for Truman’s inaugural fundraising campaign “Bright Minds Bright Futures” from 2006 to 2011 and chaired the Colorado Regional Campaign. For the past four years, Janet has taught critical thinking classes at Metro State University of Denver. At MSU Denver, she serves on the METROLEADS committee, which defines the university’s leadership programs and develops key leaders. 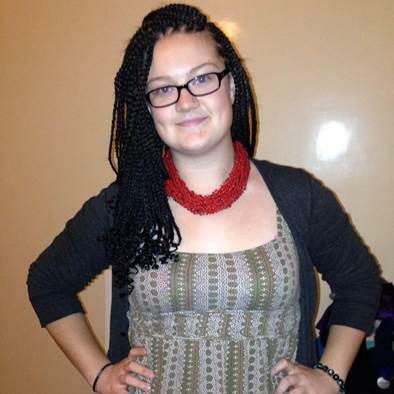 She also teaches English in the University’s TRIO Upward Bound program. During her career in education, Janet has taught sixth grade through university levels in both public and private institutions in Missouri, Texas and Colorado. She has been active in numerous professional organizations including Phi Delta Kappa and Delta Kappa Gamma, where she served as chapter president of Kappa Theta in Texas and Omega State Expansion Committee Chair in Colorado. At state education levels, Janet has worked on curriculum and testing for both the Missouri Department of Elementary and Secondary Education Goals 2000 Curriculum and Assessment Issues Task Force and the Texas Education Agency. She has presented at numerous conferences and published internationally. The McClaskeys have strong family ties to Truman and have been closely involved with the University for many years. Mike’s parents, Bill (’53, ’59) and Martha McClaskey (’49), earned their degrees from Truman and Martha taught at Truman most of her career. Mike’s aunt, Bertha McClaskey (’53), was also an alumna that spent her career in elementary and secondary education. 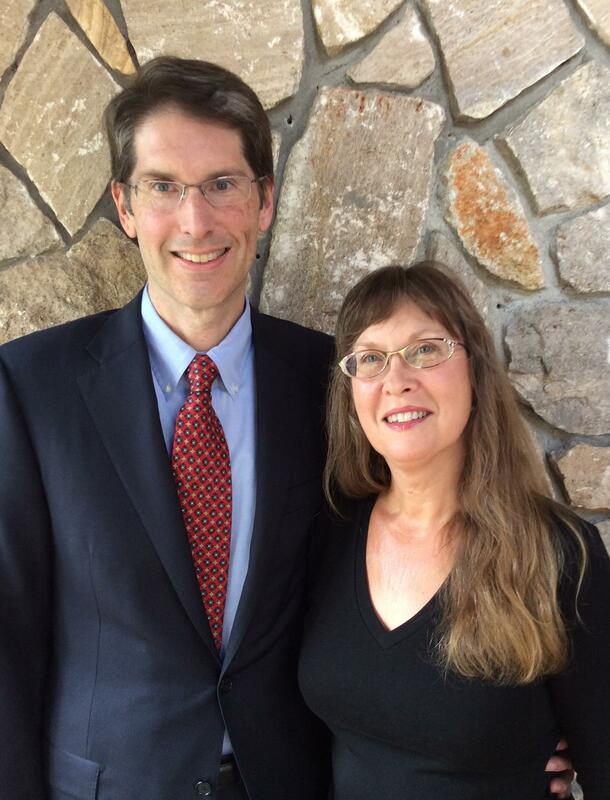 Mike and Janet are members of the John R. Kirk Society, the Joseph Baldwin Society and the President’s Circle. They have established the Martha McClaskey Humanities Scholarship in honor and memory of Mike’s mother, who taught English at Truman from 1959 to 1978. In addition, they have provided a multi-million dollar bequest through their estate to create the McClaskey Family Endowment, a multi-purpose fund to benefit the School of Arts and Letters. 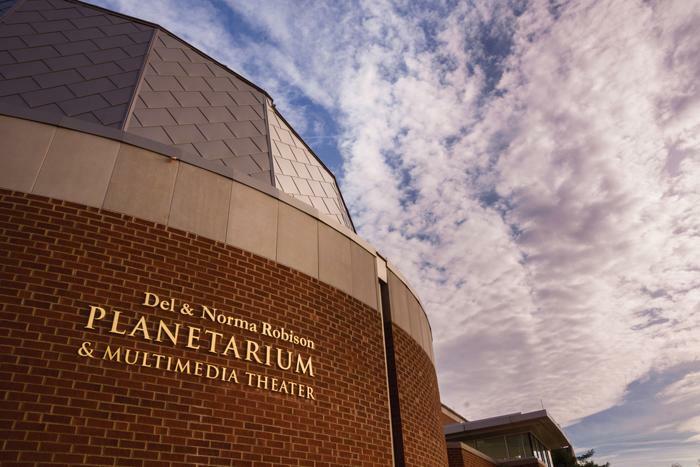 Through a partnership of University resources and private contributions, the Del and Norma Robison Planetarium and Multimedia Theater at Truman is ready for launch. A ribbon cutting ceremony will take place at 10:45 a.m. Oct. 11 between the Student Union Building and the northwest corner of Magruder Hall. Located in Magruder Hall, the Planetarium will enhance Truman’s educational mission as a liberal arts and sciences institution and strengthen the regional recruitment of students by bringing them on campus for presentations and performances. The facility will be an academic resource to support Truman courses in the sciences and fine arts, a community resource for regularly scheduled shows for the general public and an academic outreach by providing programming for local K-12 and home school populations. Del and Norma Robison of Kirksville have made a leadership gift to the project. The Robisons are graduates of Truman State University and enjoyed long and distinguished teaching careers, including service to Novinger, Moberly and St. Louis area schools. While residents of Chesterfield, Mo., and teaching in the Pattonville School District, Del was actively involved in securing a grant to equip the district with a planetarium and observatory, becoming one of the few school districts to have such a facility. The 60-seat, 1,800-square-foot Planetarium and Multimedia Theater project started in 2005 with the expansion and renovation of Magruder Hall. With the help of private donations from alumni, parents and friends of the University, the Planetarium is now the only such facility in nearly a 100-miles radius of Kirksville. For more information, contact the Office of Advancement at 660.785.4133. Truman’s 2014 United Way Campaign began Sept. 12 with a goal of $56,000. All faculty and staff members should have received information about the campaign through campus mail. Individuals who did not receive campaign information, or have questions, may contact co-chairs Maggie Herron at mherron@truman.edu or Marty Jayne at mjayne@truman.edu. Donations support the United Way of Adair County, with all funds staying in the area. The local United Way has among the lowest overhead in the nation, allowing a greater percentage of contributions to go straight to local programs helping people pursue the goals of education, income and health. Recent statistics show the United Way touches one out of three individuals in the area. Pictured are members of the Truman United Way campaign. Left to right: Megan Swingle, Food Fast chair; Maggie Herron, co-chair; Stephanie Dunn; Abe Copi; John Dungan, director of United Way; University President Troy Paino; Andrew Springmann; Natalie Garlock; and Marty Jayne, co-chair. This semester, students in two of Truman’s HLTH150 nutrition courses have partnered with the SERVE Center to raise money for the Food Bank for Central and Northeast Missouri. The classes divided into 14 small groups, each of which planned a fundraiser as part of a service-learning opportunity. Students began planning events, raffles and donation requests after learning the Food Bank is able to purchase 15 pounds of food for families in need with only one dollar. These student-led projects took place in the past few weeks and culminated during the Big Week of Giving, when the class established donation tables on campus and throughout Kirksville. The first of these fundraiser events was completed Sept. 13, when one group set up a table display outside the Student Union Building and asked visiting parents and family members to consider donating to the cause. By sharing statistics about hungry families needing help, and how a small donation can make a big impact, the team exceeded their project goal and raised $1,000. Group members spoke with more than 1,000 local and visiting members of the campus community about the role of the Food Bank, and got the class projects off to an exciting start. 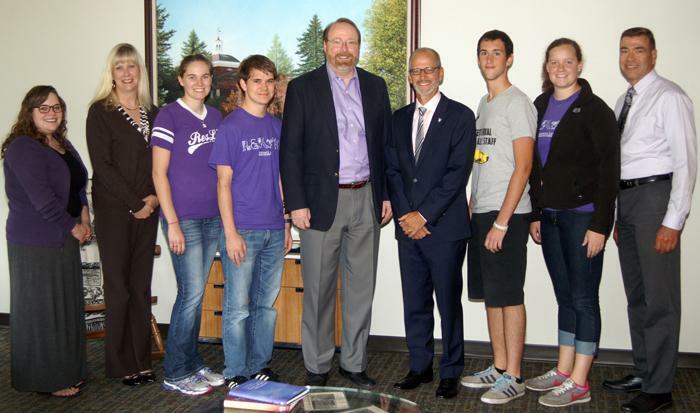 Another fundraising project incorporated the help of University President Troy Paino. Raffle tickets were sold, and the lucky winner was able to pie him in the face at the Sept. 27 football game. 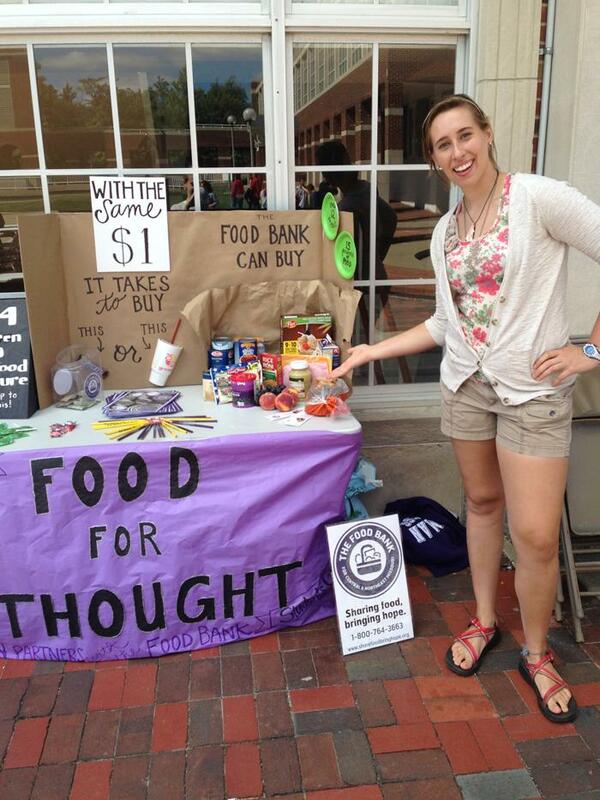 There will also be several fundraisers throughout the semester taking place in conjunction with local restaurants. All of the proceeds raised in these projects will be donated directly to the Food Bank for Central and Northeast Missouri. The Kirksville R-III School District received the “Community Partner of the Year” award and was recognized at the Community Partner Appreciation Luncheon, Sept. 30. 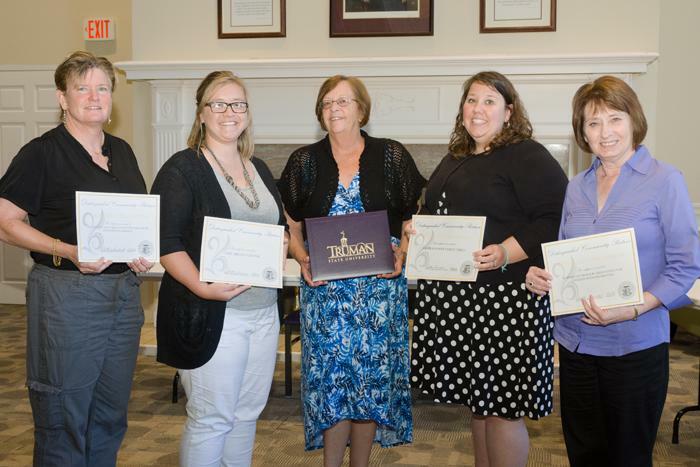 The Kirksville R-III School District was nominated by Sally Cook, associate professor of linguistics, for its service partnership with the University over the last nine years. Cook has worked with Cathy Kelly, the ESL specialist for Kirksville R-III, to provide positive learning opportunities for Truman students outside of a traditional classroom experience. The program pairs Truman students with non-native speakers who need additional English tutoring. Other nominations include the LIFE Ability Center, the Adair County Family YMCA, Heartland Task Force C-2000 Substance Abuse Prevention Coalition, the Northeast Missouri Association for Citizens with Disabilities (NACD) and the Green Thumb Project. The LIFE Ability Center was nominated by student Katie Shields and the Disabilities Studies Committee. The center provides resources and a comfortable environment for people with developmental delays. Activities and classes encourage independence, self-esteem and a sense of community. The Adair County Family YMCA was nominated by student Trevor Wood. The YMCA partners with service organizations on campus to promote and facilitate youth development programs. These programs enrich the lives of Kirksville’s youth and instill positive lifelong values. On behalf of Eta Sigma Gamma, Kaitlyn McManus nominated the Heartland Task Force C-2000 Substance Abuse Prevention Coalition. Eta Sigma Gamma, exercise science classes and Cardinal Key have worked with the Heartland Task Force for more than 15 years as partners in substance abuse prevention education and positive youth development programs. Sigma Tau Gamma nominated the NACD. The locally operated, non-profit organization provides services and equipment to local, handicapped citizens. They have specifically supported Sigma Tau Gamma’s philanthropy events, as well as other charitable organizations. The Green Thumb project was nominated by Liza Mann and Aly Duvall. The project was founded in 2011 by two women to expand the impact of sustainability education. They provide educational resources to community members, offer access to affordable local food movements and create community gardens. 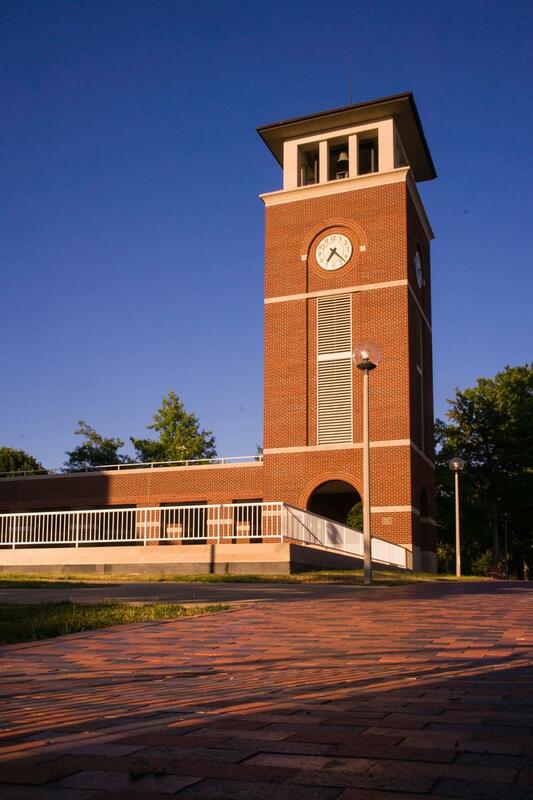 For more information on the Community Partner Award, visit serve.truman.edu/community-partner-award-nomination/. Honorees at the Community Partner Appreciation Luncheon, from left to right: Carol Cox, Heartland Task Force C-2000 Substance Abuse Prevention Coalition; Kim Baker, LIFE Ability Center; Cathy Kelly, Kirksville R-III Schools; Sarah Riffer, Adair County YMCA; Linda Treasure, Northeast Missouri Association for Citizens with Disabilities. Students who wish to receive financial support from the University to attend the National Conference on Undergraduate Research (NCUR) should apply for funding through the Office of Student Research (OSR) by Oct. 24. The 29th Annual NCUR Conference will take place in Cheney, Wash. from April 16-18. The OSR will be able to provide support for up to 24 students. A completed application, including an abstract, should be submitted by 11:59 p.m. Oct. 24. A copy of the application form can be found at osr.truman.edu/ncur. Abstract guidelines can be found at www.cur.org/ncur_2015/abstract_submission/. Do not submit abstracts to NCUR until funding is granted from the OSR. The OSR will rank the applications and award travel funds to no more than 24 students. Priority will be given to senior students, students who have not previously attended NCUR and students who will not have the opportunity to present their research elsewhere, except for Truman’s Student Research Conference. Applicants will be notified whether or not they have been awarded funding via email no later than Nov. 7. Students who are denied funding from the OSR are encouraged to seek alternative sources of travel funds. After a student has secured funding for travel to NCUR 2015, whether through the OSR or from some other source, he or she must submit their abstract to NCUR through the NCUR website, www.cur.org/ncur_2015/, by Dec. 2. Abstracts will be reviewed by a panel of faculty at Eastern Washington University, and students will be notified whether their abstract has been accepted by the NCUR by Jan. 19. The OSR will contact all students who have been accepted by the NCUR to present at the conference in January, and will coordinate registration and travel for the entire Truman group. The Office of Citizenship and Community Standards (OCCS) is seeking freshmen and sophomores to serve as student affiliates on the University Conduct Board. All are invited to join in the festivities. 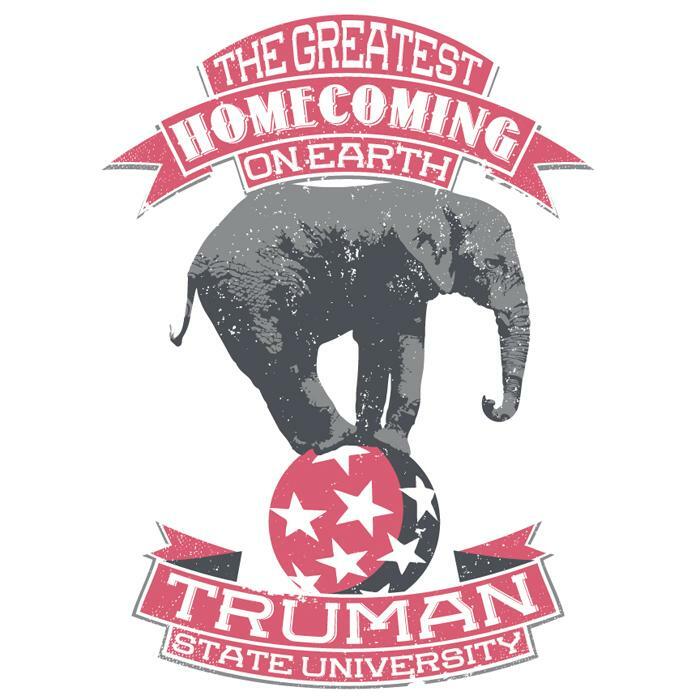 For more information on student events, visit the Homecoming website at homecoming.truman.edu. The majority of events are free and any events that cost can be viewed on the website. For information on alumni activities, visit the alumni schedule of events here. Professor Antonio Scuderi will present his findings from research on the European carnival at 7 p.m. Oct. 7 in Baldwin Hall 176 (the Little Theatre). Various aspects of European culture may have their origins in this primordial Indo-European rite of passage. “Carnival,” a fertility rite with many faces, inclduding the Roman Saturnalia, was so prevalent in ancient Europe that it made itself felt in the traditional Christian calendar and generated a host of cultural traditions and iconic symbols. TruAdventure will once again offer adventure travel trips for Summer 2015. An informational meeting will take place at 6:30 p.m. Oct. 7 in Pershing Room 3104 for anyone interested in learning more about travel opportunities. Due to last year’s popularity, TruAdventure is offering an introductory backpacking trip in Grand Canyon National Park from May 27 to June 2. New for 2015 will be a five-day canoe and camping trip to the Boundary Waters Canoe Area of Minnesota July 22-July 26. The meeting will provide information on costs, specific activities and itineraries and how to register. Limited spots are available on the trips. For more information, contact Dr. Jennifer Hurst at jhurst@truman.edu. The Board of Governors will meet at 1 p.m. Oct. 10 in the Student Union Building Conference Room 3000. Admission is free and open to the first 60 people to arrive. Interested in studying abroad in Switzerland this spring but unsure how to get there? Students applying to study abroad during the Spring 2015 semester at the CCIS-approved site at Franklin University in Lugano, Switzerland will be offered free round-trip airfare from JFK Airport. Students must meet all application and deposit requirements by Oct. 27 to qualify. Visit the website to learn more about this program. Hands-On Workshop – Truman’s Google Drive/Google Apps Suite? Daniel Mandell, professor of history, served as commenter in the inaugural meeting of the Missouri Regional Seminar on Early American History, Sept. 24 at the Missouri History Museum in St. Louis. where he (and they) discussed a chapter from Prof. Lorri Glover’s forthcoming Johns Hopkins University Press book, The Fate of the Revolution: Virginians Debate the Constitution. Datha Damron-Martinez, associate professor of business administration, and Katherine Jackson, associate professor of business administration, received the top prize in the AxcessCapon Teaching Innovation Competition for their paper and video entitled, “Connecting Consumer Behavior with Marketing Research through Garbology.” The competition was held in conjunction with the national meeting of the Marketing Management Association held in San Antonio, Texas. Professors Martinez and Jackson shared a $1,000 prize. The Summer 2015 application for the Critical Language Program is now open! Foundation scholarship applications for Truman students in the spring 2015 semester are now available. Applications are available online and are due by midnight, Nov. 1. To apply, log in to TruView, go to the Student Tab, Student Finances, Foundation Scholarships.